The DC Department of Housing and Community Development (DHCD) and the National Community Reinvestment Coalition (NCRC) built on ongoing initiatives to develop a comprehensive strategy to address housing challenges in the Ivy City and Trinidad neighborhoods. A Comprehensive Vision for Community Redevelopment. To be successful, community leaders, residents, and business owners helped shape the process. Community involvement is essential to achieving the above-stated goals and developing effective strategies. This initiative was funded through Round II of the U.S. Department of Housing and Urban Development (HUD) Neighborhood Stabilization Program. The framework for catalytic community plans begins with accessing and understanding the needs of community. The Ivy City and Trinidad Neighborhood Stabilization Initiative began with an intensive community engagement campaign, to ensure that future developments were being shaped by the input of current residents. The community engagement portion of the initiative included interactive presentations at community meetings, in addition to local focus group sessions. A total of six resident groups were held weekly between the periods of March 9th, 2011 to April 20th, to discuss a wide range of topics related to community development, such as: Workforce Development Needs, Housing Impediments and Opportunities, Social Conditions and Neighborhood Services, Commercial and Business Development, Perspectives on Redevelopment, and Community Greening. Meetings included participatory mapping exercises, and large comment boards to maximize meaningful resident input throughout the engagement process. To gain a more comprehensive perspective on commercial development and employment opportunities, staff collected over 693 workforce skills surveys from area residents that incorporated information on employment history, education, and work preferences. Over 200 of the surveys were collected from community members who were unemployed at that time. The PeoplePlanDC initiative layered community engagement with expert market research in the Ivy City and Trinidad neighborhoods to develop realistic, informed recommendations that anchor existing residents to their neighborhoods and build household wealth. First, the world-renowned Urban Institute conducted a thorough demographic assessment of the Ivy City and Trinidad neighborhoods, which provided the most up-to-date information on social conditions of area residents and foreclosure prevalence in addition to detailed interactive maps. Torti Galas Urban provided an assessment of the current physical neighborhood conditions, as well as an environmental evaluation that included suggestions on how to make the community greener. As part of the initiative’s goal to increase commercial development and employment opportunities, NCRC workforce staff conducted an analysis of the shortcomings and benefits of available workforce training programs in Ivy City and Trinidad. Also, local real estate advisory firm Green Door Advisors created an assessment of potential commercial corridor strategies, which identifies retail and office market trends within the neighborhoods and surrounding areas. Democracy Collaborative, a non-profit organization based out of the University of Maryland, provided a preliminary assessment of potential worker-owned business co-ops that offer an alternative strategy to community wealth-building, and involved over twenty-three interviews involving more than thirty stakeholders. The initiative’s recommendations to provide greater access to decent, affordable housing were shaped by a multitude of key partners. Expert research analysts at the Center for Housing Policy wrote a wide-ranging Homeownership Strategies Report, which explores the barriers to homeownership faced by potential lower-income buyers in Ivy City & Trinidad. This served as a complement to the NCRC’s Access to Finance report, a comprehensive comparative review of access to consumer credit and disparities in home lending. The market analysis conducted by expert partners layered with the insight gained from community engagement ensures that community assets will be leveraged, and that the DHCD implements development in accordance with the community’s input and vision for the future. The People Plan DC approach to Ivy City and Trinidad was anchored by the development of a comprehensive community vision, which included both embracing the character of the neighborhood and visualizing the potential of future development among key corridors. The nationally-acclaimed Urban Advantage studio created photomontages of the Ivy City and Trinidad community, and provided community members with on-the-ground images of what future developments could entail. After studying historic photographs of the Ivy City and Trinidad neighborhood, engaging with local residents and consulting designers, community visioning expert Steve Price took key neighborhood landmarks and corridors such as the Crummel School, Capitol Avenue, Orren Street, and Bladensburg Road, and superimposed images of trees, architecture, street lamps, and pedestrians on top to illustrate their possibilities for sustainable, walkable urbanism. His photomontages act as a vehicle to anchor further investment from outside the community, as they provide a visualization of the crossroads of social factors contributing to urban design and their physical environment. Furthermore, they allow residents to feel even more invested in their community and its potential improvement, especially when the longevity and incremental stages of projects have a tendency to deter resident buy-in. Price’s images reinforce the fact that something as simple as planting flowers should not be underestimated, as there are many large and small factors that contribute to a “complete street”. 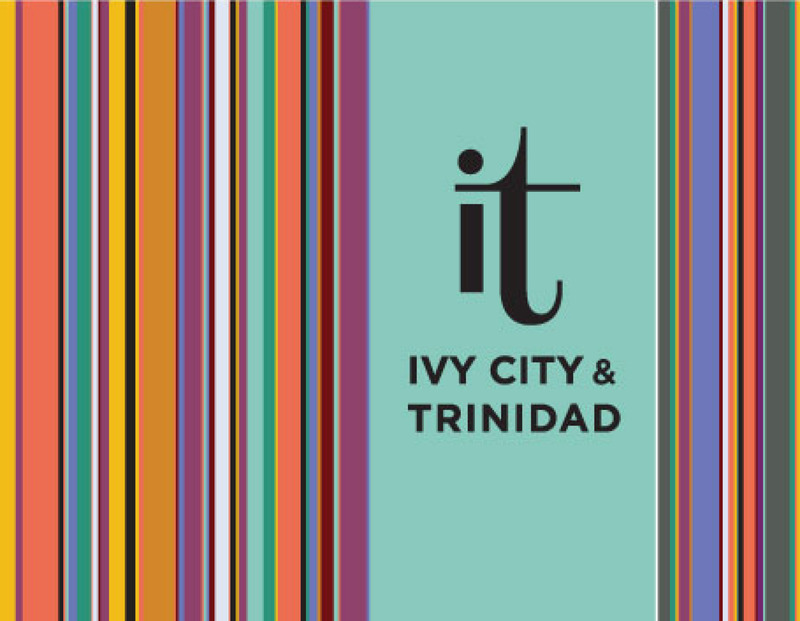 Ivy City/Trinidad logo: Based on input from neighborhood residents, local design firm Trialogue Studio created a targeted marketing campaign to attract potential homeowners, developers, and investors in a creative way. One of the most pivotal accomplishments of the Ivy City and Trinidad neighborhood Stabilization Initiative was the development of a unique, neighborhood branding strategy. The it campaign is a reflection of the area’s unique and original character, which residents described as bold, spirited, stable, thriving, neighborly and rooted. The campaign sought to eliminate some of the negative perceptions that many residents of the District of Columbia had associated with the neighborhoods, in addition to being used as collateral to leverage strategic partnerships to advance future projects. Trialogue’s neighborhood brand design included a strategy toolkit for its implementation, which explicated ways of using the brand to promote upcoming events, programs and initiatives to the community, and raise awareness to non-resident populations. Combined, the reimaged photographs and marketing tools were highly effective ways to help residents understand current conditions of Ivy City and Trinidad and communicate their vision for the future. Photoreimaging – Crummell School, Capitol Ave., Orren St., and Bladensburg Rd.